Please refer to our stock # W-JO7 when inquiring. 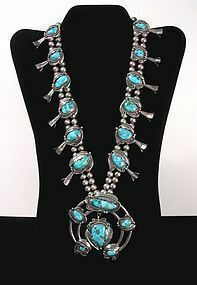 DESCRIPTION: A beautiful Navajo squash blossom necklace with twelve blossoms of graduated size and a 3 1/4" naja with dangle, all set with lovely cabochons of blue turquoise with chocolate brown veining, mounted on a silver bead necklace. Each stone is partially covered with leaf-form silver appliqué work; twisted silver wire borders the bezels. Dating from the second half of the 20th C., the necklace is in excellent condition with no broken pieces or missing stones. The stones are undamaged and secure in smooth bezels. DIMENSIONS: 17" long from clasp to bottom of naja; total weight is 250 grams or 8.8 oz.